Oh, so you want to buy a house Up North? You wish to experience glorious August sunsets? You’d like to shred the slopes at amazing ski resorts? You’re interested in fall colors? And you want to be near Traverse City but not have to pay Traverse City prices for that house? Good news: Elk Rapids will welcome you with open arms. 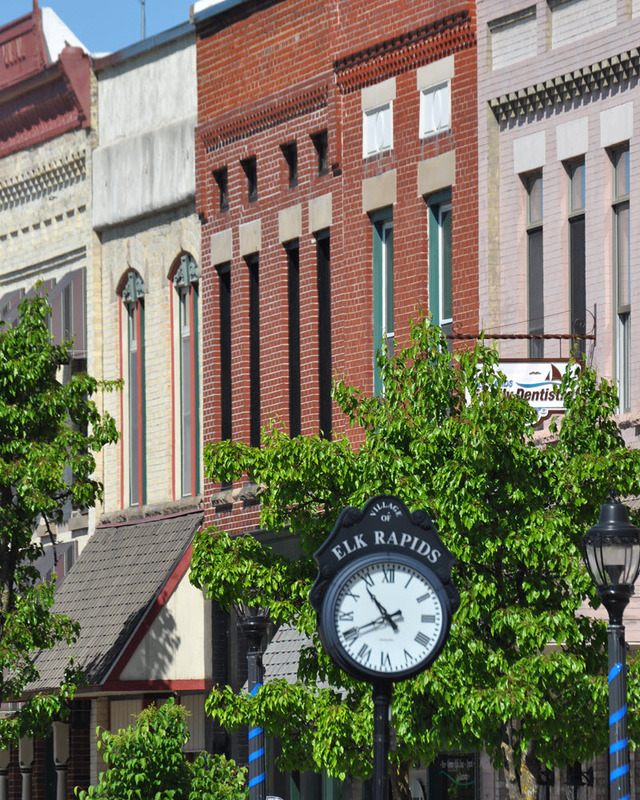 Elk Rapids Township is a cozy village of about 3,000 year-round residents and countless others during the warm months as tourists scramble for a Pure Michigan getaway. And why not? You can get sunrises over Elk Lake and sunsets over Grand Traverse Bay. Ice fishing in the winter? Absolutely. Pleasure cruising in the summer? Indeed. Fishing? Camping? A winery? Yes, yes, and yes. Want more? The city life of Traverse City is a short 20-minute drive. If you’re considering purchasing a home in Elk Rapids to live there full-time, or as a vacation spot, you’ll find a healthy mix of properties. Homes in Elk Rapids are diverse. There are, as one might expect, World War II-era homes that are at least 50+ years old. On the other end of the spectrum are large vacation homes on the lakes and scattered throughout the township. Would you care for a 3,500 square-foot home with four bedrooms, four bathrooms, and a dock? It can be yours. Too ambitious? Retire to a quaint and low-maintenance 1,500 square-foot home with three bedrooms. Elk Rapids is set up as a walkable community with plenty of trees that cast all kinds of lovely shadows when the sun shines. If you’re looking to Elk Rapids as a place that competes for more than space in your summer photo albums, you’ll appreciate the small-town feel and the ability to know your neighbors while still maintaining your privacy. There’s Elk Rapids Day Park, which features a beach, nature trails, and a picnic area. Your kids will be Elks (of course) within the Elk Rapids Public Schools system. Cherryland Middle School, Lakeland Elementary, and Mill Creek Elementary are the only International Baccalaureate World Schools in Northern Michigan, and the high school was ranked #1 in the region in ACT scores. For out-of-the-classroom fun, don’t miss Harbor Days, the village’s annual festival where locals and out-of-towners come together for athletic events, carnival rides, a parade, and fireworks. And to experience more than Elk Rapids has to offer, visit any of the nearby Lake Michigan beaches, take your bike out on Glacial Hills Natural Area and Pathway, or visit the world-famous sand dunes just a short drive away. And when your friends ask where the name came from, here’s your answer: An early settler discovered a pair of elk antlers in the river that runs through the city, and it became the Elk River. Of course, the village that sprang up along the river couldn’t not involve Elk. Hence, Elk Rapids. Trivia aside, whether you’re in the market for a year-round northern Michigan lifestyle, or just want a home for the warm months, Elk Rapids provides everything you could want. ©2019 Johnstone and Johnstone. All rights reserved.